We’ve been getting call after call to see if we were open due to the recent floods in The Barlow. We were, thankfully, unaffected. Farmhouse Inspired Beer in the heart of Sonoma County, CA. 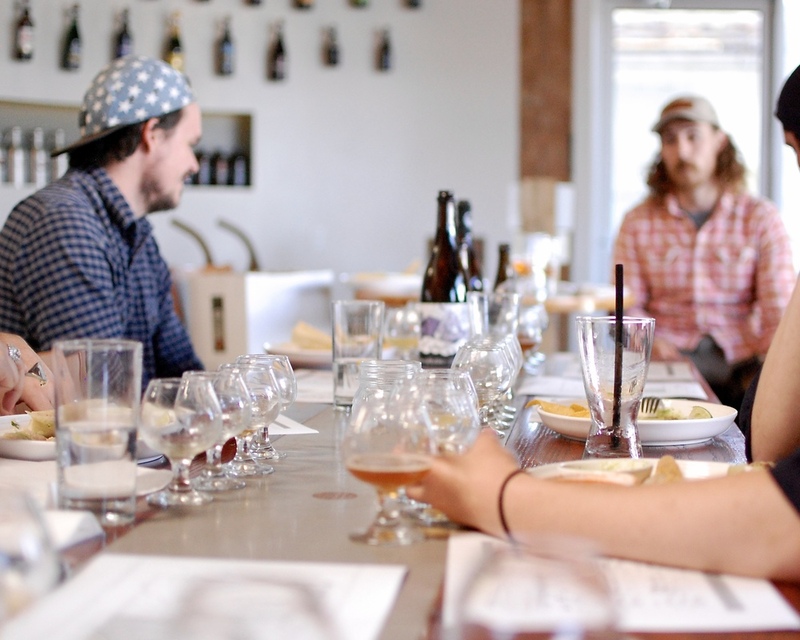 Founded in August of 2013, Woodfour Brewing Co. is focused on brewing the finest farmhouse style beers. Located in the Barlow in the heart of Sebastopol, CA; a former apple processing facility, Woodfour specializes in brewing saisons, sours and barrel aged beers with a strong awareness of terroir. Woodfour's master brewer, Seth Wood, has an extensive background in wine making and fermentation having studied fermentation science at CSU, Fresno. Seth draws heavily on his background as he creates yeast driven beers inspired by the timeless traditions of European farmhouse brewers. BERLINER WEISSE / Brewed using a traditional sour mash and then fermented in an open top oak founder this tart wheat ale is a unique amalgamation of German inspiration and Sonoma County terroir. Dry, funky, and refreshing...Prost! Ask your bartender how to serve it Mit Schuss! SOUR FARMHOUSE ALE / Spontanously fermented farmhouse style ale; fruity apricot aroma with light funky notes and sour dry finish. BLACKBERRY BRETT MOTHER / Blend of 100% Brett Fermented Saison and Sour Ale aged with Local Blackberry (LIMITED). QUERCUS RESERVE WILDO RANCH / Sour Ale Dry Hopped with Sebastopol Cascade from Wildo Ranch (LIMITED). NEW RIDGE LAGER / Rustic and unfiltered golden country lager. Crisp and clean with pilsner malt aromas; a true farmer’s beer. REMOTE OPERATOR / Classic American style pale brewed with Denali and Idaho, then dry hopped with Callista. Intense aromas of pineapple and guava with dank undertones and clean sessionable finish. BOHEMIAN NECTAR / A classic saison at the core featuring Belgian Pils and a touch of wheat malt. We then layer a series of dry hopping additions to create a juicy tropical nose, ending with a crisp and refreshing finish. Sunshine in a glass!. TINY BABY HANDS / Vienna Inspired Lager with Simcoe Hops and Admiral Victory Malts. MORNING SELFIE / Black Lager infused with Sebastopol's own Retrograde Dark Nebula roasted coffee. With well-rounded coffee notes, this beer has quickly risen to the top as one of our favorites. FROSTY’S LAMENT / Belgian Style Dubbel Ale just in time for the holidays. Have a pint before the meltdown! NEOLITHIC / Cascadian Rye Ale with notes of molases, spice, carmelized stone fruit and cocoa. NEOLITHIC REVOLUTION / Spirit Works Whiskey Barrel aged Cascadian Rye Ale on Nirto! We take pride in what we do and choose to work with people who share our passions. Here are some of the fine purveyors that carry our beers. Interested in carrying Woodfour beer at your establishment? Host your next event or rehearsal dinner with us here at Woodfour Brewing Company, located in the heart of Sebastopol, CA. Our space can be tailored to fit your specific needs; whether an intimate dinner in the barrel room (yes, many of our beers spend time in barrel), corporate beer and food pairing, rehearsal dinner on the patio, or all of the above, we are here to accommodate you. Our combination of exquisite beers, elevated food, and an incredible dining experience makes Woodfour Brewing Company the perfect place to host your next event.